Today was Tiara Friday, so everyone wore tiaras on their hats. Helen and Guy, since they were attending the Dean’s List Lunch, drove for the first match. Unfortunately, the phone on the robot controller crashed, most likely due to a motor controller returning bad values. We mistakenly thought this to be a fluke. During our last match of the day, that motor controller disconnected, not allowing us to use the arm properly. Clearly, we’ve now replaced that motor controller. Today, we won all three of our matches! 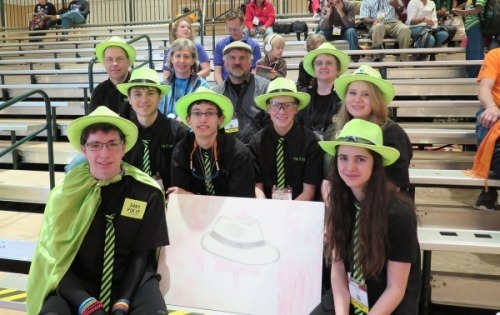 The team is at the FTC World Championships. The morning was busy with setting up the pit, inspections, and our judging interview. 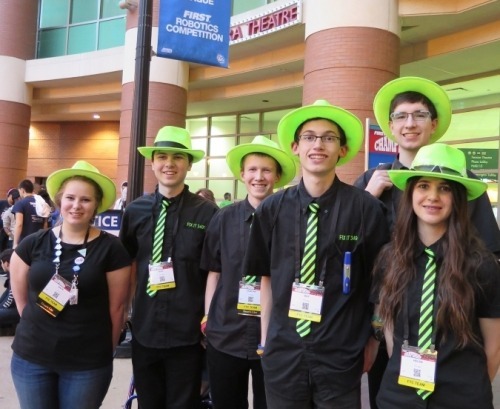 To mark the occasion of the World Championships, 3491-FIX-IT has launched a contest for the best tips for a rookie FTC team, open to all FTC teams at the Championship, with handsome prizes courtesy of 3491 sponsor, Actuonix Motion Devices. For details, see the Rookie Tips Contest page. 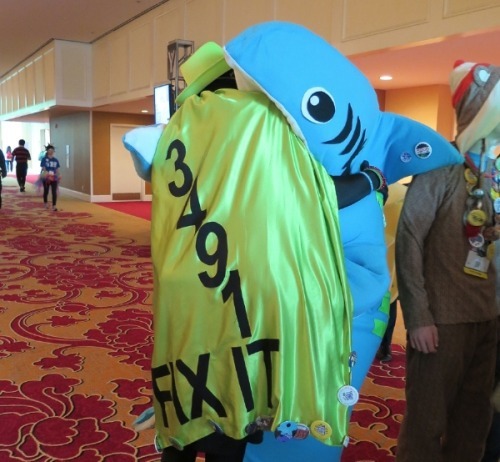 The FIX IT 3491 team is off to the FTC World Championships, which will run from April 27th through 30th at the Union Station in downtown St. Louis. Our robot, Lily, has been primed and made ready, with fixes and improvements in the light of her performance at the Super-Regionals West last month. Look here for further updates in the coming days. 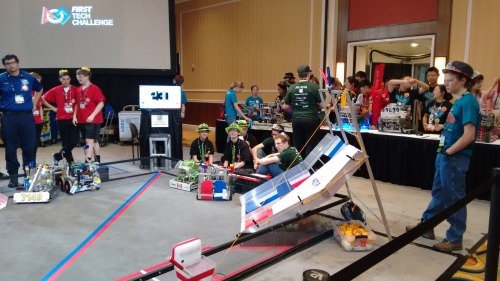 The first event at World’s on Saturday was Alliance selection. We didn’t make it into an alliance. Jack did a great job as our mascot for the dance, then we watched the finals and the awards. On Friday we started out well. Everything worked properly and our partner scored in the centre goal. We got our high score for the season of 694 points but still lost the match. In our next match an opposing robot crashed into us at a high speed and broke our ball collection system. Our last match went better and we won. On Thursday we played three matches. In the first match the scissor lift wire came undone and therefore we could not actually score balls. 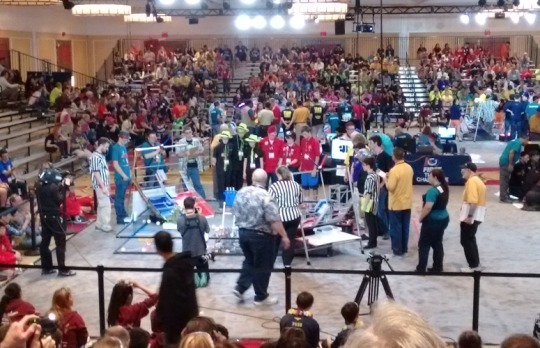 In our second match the robot finally worked properly. We scored in the medium goal in autonomous and scored more in the medium goal later in tele-op and filled the centre goal in end game. Although we did well we still lost the match. In our last match of the day, our autonomous program didn’t work, but we still won the match. Worlds was very impressive. 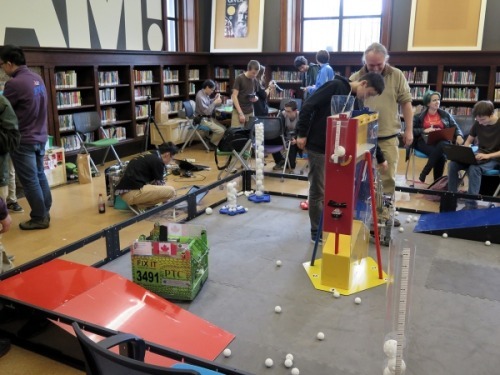 There were 128 pits where teams could work on their robot and decorate the space showing their team and country. Some pits had very elaborate décor. 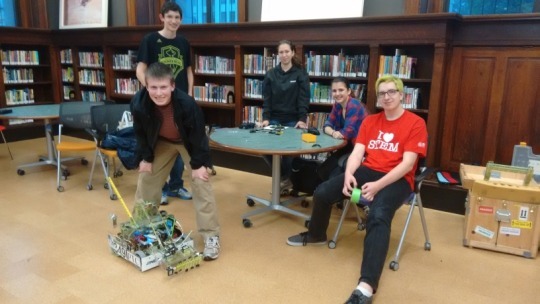 The FIX IT team was invited to join other international teams at the Public Library.